IAMBRIGITTE : - BER Months Na! Homayghad, - BER months na! 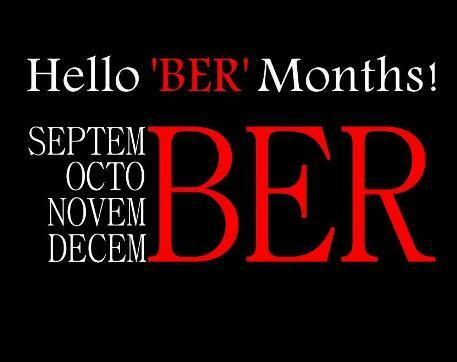 But seriously, you know what happens once we start with the -BER months. Before you know it, it's Christmas already. Yep, that's how time flies most especially during -BER months. Kaya as early as now, start with your Gift List na and if you have extra moolah to spare, start buying na. So you don't end up going crazy doing last minute shopping. And worse, end up going beyond your budget. Planning is the key, and preparing early. Naks, if only I'd follow my own advice. Hahaha! For this year, I don't think Mr. X and I would be going home for the holidays. He took the December - January leave last year and now it's somebody else's turn. Also, we're planning to do "it" either late this year or early next year so there will be a lot of preparations to do prior. And lastly, walang budget! Hahaha. I really wish we could go home for the holidays and be with our families. Iba talaga ang Pasko sa Pinas. My fellow OFWs would agree, yes!? Hopefully, everything gets sorted out and then maybe we can bring my Mom and my Aunt over after the holidays. Good thing Mom's ticket will be free starting December (thanks to my gorgeous FA sister!) so it'll only be my Aunt's ticket that we need to pay for. Hmm..and of course the pasyal, food and well, some shopping? Hahaha! Oh well...I'm keeping my fingers crossed that all these things would push thru as planned. Sabi nga nila, "Think Positive!" YEBAH!